Nickel is a silvery white and lustrous metal with a slight golden glow. It is a non-ferrous metal in that it contains no iron and a base metal in that it occurs commonly in the earth and oxidizes or corrodes relatively easily and reacts variably with diluted hydrochloric acid to form hydrogen. Archeologists date nickel use back to 3500 BC. Axel Fredrik Cronstedt first classified nickel as an element in 1751. The word nickel comes from the German, kupfernickel, meaning devil's copper. Considering nickel's highly volatile price, it is not surprising that the root of its name reflects devilish price behavior. 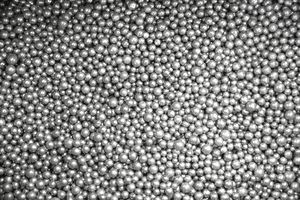 Nickel is resistant to corrosion, it an excellent metal for plating iron and brass. Nickel is ferromagnetic. Strong magnets require iron and rare earth metals but magnets of lesser strength utilize nickel. Coinage, glass production, rechargeable batteries and bulletproof safes are just some of the products that can be made of nickel. Nickel ore comes from the earth's crust, extraction is via opencast and deep shaft mines. A smelting and refining process separates the metal from the mined ore. About one million tons of nickel production each year comes from mines around the world. The largest production comes from China and Russia, which account for some 50% of global production. Other significant nickel producing countries include Indonesia, the Philippines, Japan, Canada, Australia, Cuba, and Norway. The largest reserves exist in Australia and New Caledonia. MMC Norilsk Nickel is the world's single largest producer of the metal. Norilsk produces platinum group metals (PGMs) as a byproduct of their nickel mining. In 2011, this mine accounted for more than 25% of world nickel production. Stainless steel and alloys account for almost 87% of annual nickel demand. China is the world's largest consumer of nickel. China is a major consuming force in all base metal markets, due to their infrastructure building needs. Nickel forwards and options trade on the London Metal Exchange (LME). Each contract represents 6 metric tons with purity of at least 99.8% conforming to LME required shapes, sizes and brands. The brand indicates the smelter that refined the metal. There is a physical delivery mechanism for nickel on the LME at approved and regulated exchange warehouse facilities. The nickel price can be highly volatile. Over the past three decades, the price has traded in a range of just under $5,000 to over $50,000 per ton. Due to small production and steady consumer demand, dramatic price movement can occur quickly. I recall trading nickel for a large commodity trading company in the late 1980s. I bought nickel from the Norilsk mine for delivery in three months. In order to hedge the trade, I sold LME contracts for the same date I expected delivery from the supplier. Norilsk is located in Siberia, it so happened that the ports froze and Norilsk could not make delivery on the agreed upon date. Since the nickel was not available to deliver, I had to buy it back on the LME. It turned out that many other commodity traders did the same trade with Norilsk and were in the same frozen boat I was. The price of nickel for the delivery date soared and the market moved into backwardation for that specific delivery date. This meant that nearby prices moved higher than deferred prices. The trade that I had originally thought would make money turned out to be a big loser as I was short on the LME with no nickel to deliver. As I could not deliver the physical metal, I bought it at the inflated market price. Nickel prices returned to normal levels once the metal came in from Norilsk which was months later. This is just an example of how volatile nickel prices can be. Another example happened just recently. In January 2014, the Indonesian government announced a mineral export ban. Their intentions are to retain strategic mineral production for domestic use and ban exports by foreign mining entities. This action, by a producing country, caused the price of nickel to move significantly higher. Nickel is an important base metal with a highly volatile price. In the US, the five-cent piece or nickel contains nickel metal. The nickel price has been so volatile over the years that at times, a nickel is actually worth a lot more than five cents. It is against US law to melt down nickels and pennies. Base metals like nickel are part of our daily lives no matter where, around the globe, we live. The price of nickel on the London Metal Exchange (LME) traded to the lowest level in twelve years in late November. Nickel traded to lows of around $8,100 per ton. Nickel is a corrosion-resistant metal that is a key ingredient in stainless steel. Nickel has been one of the worst performing commodities in 2015; the price was at over $15,000 per ton at the end of 2014. The reason for weakness in nickel is the strength of the U.S. dollar and weakness in the world's largest consumer of the metal, China. Nickel is a relatively small market with around 2 million tons produced each year. The small size of the market makes nickel a highly volatile commodity. Global economic weakness has resulted in destocking as demand has decreased for the production of stainless steel in 2015. The prospects for nickel, given the sharp move lower in 2015, will likely improve in years ahead. Lower prices will eventually lead to production cuts, as close to half the nickel production today is uneconomic. Nickel has rebounded slightly from the November lows and closed at $9,030 per ton on the LME December 4. However, the International Nickel Study Group is projecting a nickel glut given weak demand in the market. Nickel is just one of many metals and commodities that have suffered in the bear market for commodities that commenced in 2011. For now, the trend remains lower but in a volatile market like nickel, corrective rallies are likely to create price spikes in 2016. How Is Iron Ore Priced in the Market? What Are the World's 20 Largest Copper Mines?